Before I stay up late tonight to answer my #AskAwayFriday questions, I thought I better put a post inbetween that one and my #WordlessWednesday. January has been so busy this year, I realized that most of my posts for this month are #WordlessWednesday and #AskAwayFriday. I am doing better with commenting on other blogs, but writing needs some improvement. 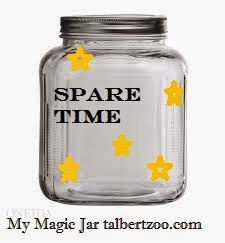 I think it is time once again to reach into my magic jar and pull out some spare time. I have exactly 43 minutes to write and publish this post before I leave to pick Kitty up for her mental health appointment. If you regularly follow this blog you may remmber that we moved to the Chicago suburbs in August and ever since I have been struggling with time management. I attempted to sort my time and priorieties, but that didn't work. My anxiety got worse because I couldn't complete all my to-do lists, so I decided to let it go. That was going well until, New Year's arrived. Yes, the New Year, new beginnings, and goal setting. Goals? What the heck are those?? I don't believe in Resolutions, instead I set goals for myself. Usually, I stick with them until mid March or April and every year I tell myself that I can make those goal last longer. I already gave up on my New Years goals for this year, or at least most of them. It's due to the fact that my magic jar is empty. I think I need to go to the spare time shop and get some more of that stuff that we busy moms crave. Too bad there isn't a real spare time store. Instead, I need to trade in what I am used to for something else that I need. Like, sleep. I am finding myself staying up a half an our later so I can visit more blogs and I wake an hour earlier than usual so I can go out for a morning run. Running on icy sidewalks in the dark of a Chicago winter isn't easy. But, the vision of myself with a flatter tummy, in my two piece bathing suit on the beaches of Florida for spring break makes the cold early morning runs worth it. At least the first two mornings this week were worth it, until I found myself too tired, the sidewalks too slippery, and my head too hurty. Today is a fitness rest day for me. Instead of my usual workout I will spend my limited spare time taking my little girl to her appointment in McHenry, filling out birthday party invitations, and going to the Little Flowers Catholic Girls Club meeting and the Blue Knights Catholic Boys Club meeting after school. What do you do in your spare time? Did you set goals for the new year?